8 + 10” Double Pencil Sharpener, for some special-diameter triangular pencils, with 8mm and 10mm holes, container has pencil hole cover, assorted red and black. I picked one of these up in my PencilThings.info days, and my results were very much the same — a very short, blunt tip. 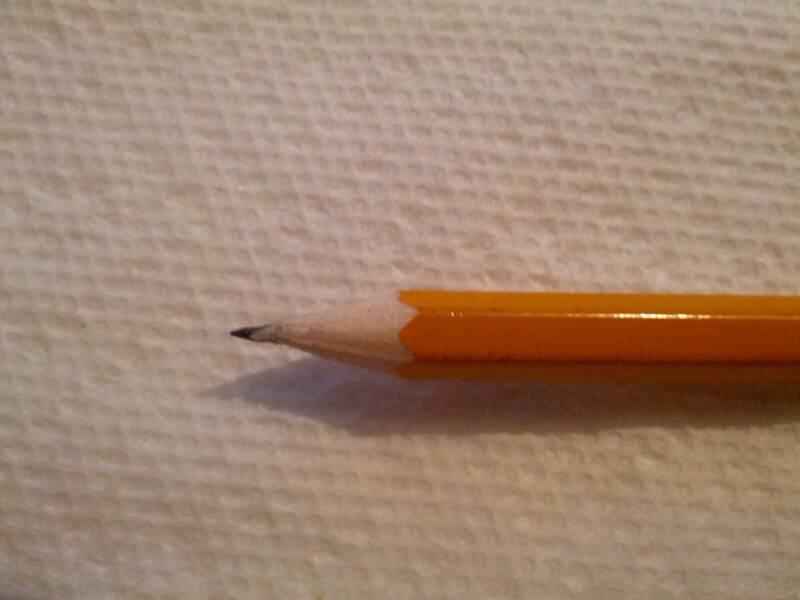 I fare better with just sticking my triangular pencils in a regular sharpener. 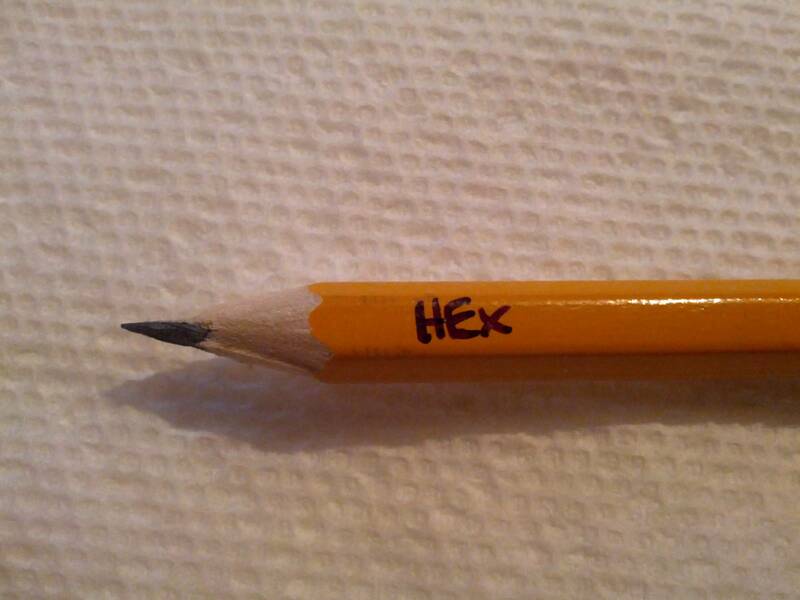 I’ve never been able to try an octagonal pencil, but I’d be interested to see how it sharpens! I doubt that there is much engineering behind this sharpener so I wouldn’t be surprised if the magnesium (?) sharpener inside this container is identical to the double-hole models that are available individually. – By the way, I am not very pleased by the newer KUM products and have the impression that both the quality and the ideas decrease. @Gunther I’ve noticed that! I have a KUM left-handed sharpener, with, of course, everything reversed, and the plastic casing cracks very easily and the shell that holds the shavings comes off very easily. I’ve taken to putting a rubber band around it until I empty it, which works fine, but looks pretty trashy. I gave up on KUM products a while back, after the web of marketing spin convinced me their Automatic Long Point Sharpener was the greatest thing since sliced bread, only to realise the sharpener rarely works as it should. This disappointment then spreads a contagion among their other products – and it seems, rightly so. Many years ago I came across the KUM Long Point sharpener and was immediately taken by it – I have enjoyed even the plastic variant and have used it quite while. At that time I have asked KUM a few questions and received quick replies. Later I switched to the metal Long Point sharpener and was pleased by it too but then I discovered that it eats my pencils – the shavings were too thick (and still are since they haven’t changed the design). At the Paperworld trade show this year I was promised a catalogue and some samples, left my contact details but got nothing yet. I find their new products disappointing, and even older ones can be good for unpleasant suprises (e. g. the lead sharpener “Onit” with holes in its container through which the graphite comes out or the Automatic Long Point sharpener which hasn’t worked for me either). A few weeks ago I have asked them twice via email but didn’t get a reply. Maybe I have asked too much or was too critical; anyway, needless to say that I am no longer happy with KUM. For the longer time, I thought it was me who does not know how to sharpen pencils, given KUM’s stellar reputation. I have the exact same sharpener and it oversharpens, that leaves a rough and inconsistent texture on both wood and lead. I will try out other portable sharpeners to compare. My brass wedge is still my favorite pocket sharpener (I like the weight) but I have NEVER ever ever been able to get an email response from KUM either, in German or in English. I’ve been using KUM hand held sharpeners for a while now. It’s hit or miss with them. A couple work really well for me and I just keep swapping the blades out. Does anyone have a recommendation for a hand held sharpener that has a container that holds the shavings? I looking for a sharpener that sharpens the wood,only and not the lead. I got one of these this weekend and I used it to sharpen several new pencils, triangular, octagonal, and round. There is nothing I can see about the way it’s made that makes it better for triangular pencils than any other sharpener. The holes are round. As shown in the photo, it just chews up your lead and leaves you without a point so much as a mountain path with a cravasse on either side. In fact, you know how with most sharpeners you can tell when the job is done because the pencil is smooth and the tension relaxes – this sharpener never gives you that feel. It makes the pencil feel “unfinished” as long as you’re sharpening. If you’re not paying attention you can grind it all the way down to the nub and it’ll never feel done.